It's finally here! Halloween 2012 is tonight! It seems like just yesterday was the beginning of October but then again, time flies when your having fun! I want to talk to you all about the amazing new Marco Pollo map being sent out to Wizards and Pirates alike as well as the Wizard101 UK Death School Celebration. 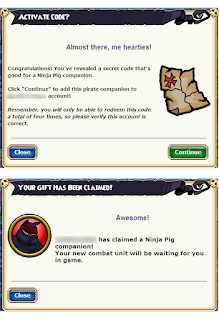 Do you want to know how to get the exclusive Ninja Pig companion or how to win some epic prizes? Then keep reading for all the current info! 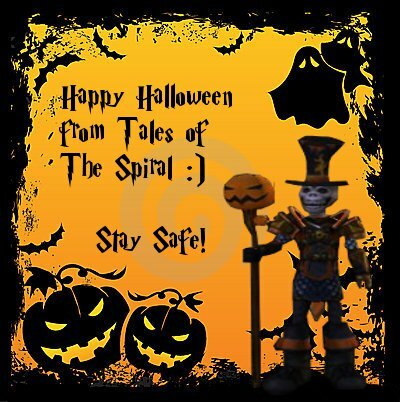 As you may have heard, many Wizards and Pirates from around the Spiral are getting real mail from KingsIsle. What does the mail contain? The mail contains an exclusive map similar to that of Marco Pollo's. Within this map, there are clues where you have to match stuff together and when you are done, you get a code for an exclusive Ninja Pig companion. It comes with 4 different codes so you can share it with your friends and whatnot. You may be wondering, "how can I get my hands on a Marco Pollo map?" or "Why didn't I get one?". The answer to this is simple. KingsIsle was sending out the maps to those who recently bought crowns or a subscription with a valid credit card with a address. If your address is given, then you should be getting your map any time soon. Do remember that you will only get one if you purchased crowns or a subscription recently. What is so special about this companion anyways? First of all, it has a cool name. Fa Lung? Come on. That's pretty epic. Second of all, it has some pretty great stats. It starts off at level 16 so it is decent. Earlier today, I was graciously given a Ninja Pig code from my good friend Blaze Dragonhorn. When I went to redeem the code, this is what I saw. I was pretty excited about this because now I have a really epic companion to add to my really epic crew! 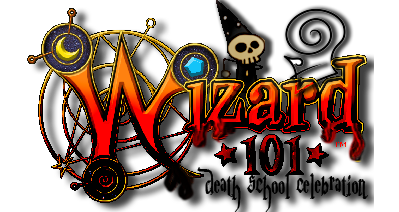 Furthermore, Wizard101 UK is wrapping up their Death School Celebration with a big bang! (no pun intended hehe). Although it is not completely over, the main event as of now is Bonfire Night. Basically, many wizards from around the Spiral will meet up at the Massive Fantasy Palace for a night of dancing, contests, mount racing, and partying around the bonfire. If you wish to attend this miraculous event, here is the information about it. Time: between 5pm and 6:30pm GMT. For all us U.S. Wizards who wish to attend, that would be between 10am and 11:30am PST. Sadly, I won't be able to make it because I will be in Chemestry class while this is going on haha. But what is a celebration without a contest? The only rule is that forum banner entries should be 399px x 212px working on a transparent background to be accepted to judging. If you add fireworks to it, then your off to a good start. The winner of this contest will be awarded 2 hoards of his/her choice. This contest closes November 4th at midnight GMT (5pm PST). I highly encourage all of you to attempt the banner contest because it's a lot of fun. I am for sure doing the banner contest. For more information on where to submit entries etc. click here. Since that is out of the way now, I just wanted to take a moment and wish you all a Happy Halloween! Personally, Halloween is a family bonding time where we all go out a trick-or-treat together, and I hope you have a safe yet enjoyable holiday. A Happy Halloween to you as well Blaze! I hope to see you at the Death School Celebration if you get some free time during school! To share one with me?